Julaihi and other distinguished guests giving their thumb’s up after inspecting the Long Lama bridge project today. LONG LAMA: The long-awaited Long Lama bridge project across Baram River is expected to be opened to public in April, next year. It is scheduled to be completed by March 31, next year, underscoring the Sarawak government’s big agenda of rural connectivity and economic development. 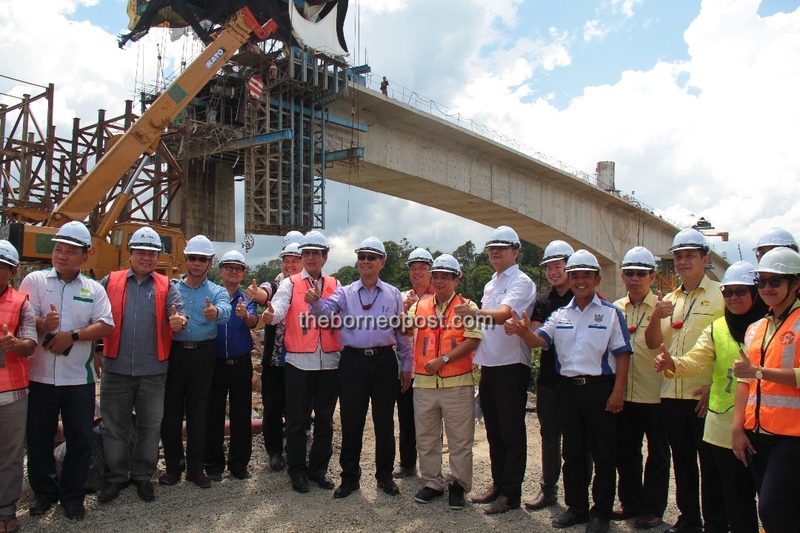 Assistant Minister of Coastal Road Datuk Julaihi Narawi said this state-funded bridge is on track of providing the connectivity for over 37,000 people in middle and upper Baram and visitors. He was in Long Lama for a briefing by Public Works Department (PWD) Sarawak and the contractor on the work progress and site visit. The Long Lama bridge construction across the Baram River started in February, 2016 shortly before the Sarawak state election, and this 36-month project was initially slated to be complete in February, next year. According to the contractor, it is now (as of October) 87. 6 per cent completed, just 2.6 per cent behind schedule due to inclement weather and the authorities has granted extended time of a month. The bridge will open up travelling or movements of the people, especially in and out of Long Lama town, Apoh and Tutoh regions, overcoming the constraints on movements based on operating hours of the ferry crossing the Baram river presently. The ferry currently operates daily from 7am to 9pm, and the heavy traffic volume could result up to an hour waiting time to cross to the other side of the river. Julaihi said the excitement of the local community was familiar to him as the completion of the Batang Sadong and Batang Samarahan bridges back then which opened up connectivity for the local communities and those throughout the state passing through this area. He believed it would transformed the socio-economic fabric of the people in Telang Usan constituency and beyond when this rural connectivity jigsaw falls into place with the completion of the bridge. The bridge is designed to be sturdy and able to withstand the force of being hit by a log-laden barge in river in the event of an accident.